This week on The Fosters, a familiar face returns to Freeform. 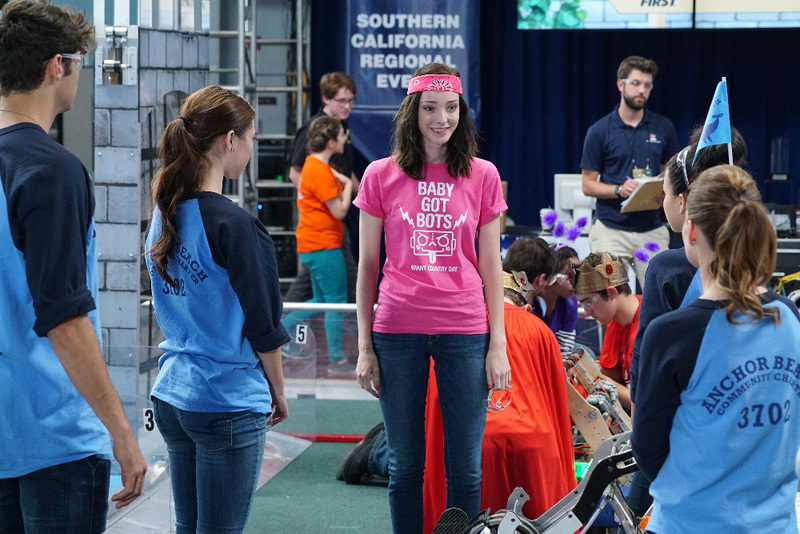 Emma Dumont of Bunheads makes a guest appearance in The Fosters 4×08 – and blends her passions for acting and robotics in the process. Read on for our interview with Aquarius star and The Fosters guest star Emma Dumont! First off, tell us about the character you play in The Fosters 4×08 and how she interacts with Mariana and the rest of the Anchor Beach robotics team. Emma Dumont: I play a girl named Sasha, and she’s on another all-girl robotics team. She’s this very posh child of wealth. She first comes off as a mean girl, so Mariana isn’t really sure if she’s nice or if she’s going to be stiff competition. The girls eventually realize that working together and using team effort and what we call “gracious professionalism” helps them, and they make a great team! You’ve been involved in robotics in real life for a few years now. What attracted you to it, and what made you stick with it? I started robotics when I was in high school, [but] I’ve always loved building things. Growing up, I used to draw blueprints, and I was obsessed with building and using my hands. When I discovered the FIRST Robotics program, I immediately got attached. I went to one meeting, and my mom couldn’t get me to leave the robot room to go home! I actually joined an all-girl robotics team, which was super-empowering considering I had no formal experience in mechanical engineering or control engineering at all. It was a really great experience. I was on the team for one season, and then I went to a different team that built even bigger robots. Being on an all-girl team really gave me the confidence to move on to the co-ed team. I actually ended up being captain of that team, and now I mentor that team! I have just always had a love for STEM, and [robotics] is a great program to do in high school. Can you talk a little bit about your experience as a FIRST Robotics mentor? Being in the program in high school, my mentors meant so much to me. [Mentorship is] a big part of the FIRST program because there are lots of different kinds of engineers, and then people who are more from the business side – people on marketing teams, people who have social media backgrounds. We have all sorts of people who mentor the teams because at FIRST, it’s not just about engineering. You have to learn business skills, you have to learn everything. My mentors were really important to me when I was on the team, and they changed my life. They really showed me that I could do anything, and when I graduated the program, I wanted to give someone else that. I wanted to pass the message forward that you can do anything and nothing can stand in your way. The mentors are a really important part of the FIRST Robotics program – they’re the backbone. The Fosters 4×08 is centered on a fictional version of the FIRST Robotics Competition, but you’ve actually competed in the real thing! What were the similarities and differences between the TV version and real life? I actually have to say they were almost identical! What you see in the robotics arc across multiple episodes of The Fosters is basically what you see in real life. In real life, there are a few more teams – we have 40 to 75 teams in any given competition at the regional level – but besides that, it’s pretty much exactly what you see. It’s high-stakes, it’s fast-moving, it’s very competitive. In the episode Girl Code, you see how the mentors can be super-competitive and how some teams have more advantages. There are teams that [come from] private schools with a lot of money, and some teams don’t. That’s really what it’s like in real life, and it’s cool to see the diversity of all the different students. I would assume that acting and robotics don’t cross paths too often. What was it like for you to blend the two in The Fosters 4×08? It was so amazing to get to do two of the things I love together! I mean, what an amazing opportunity. I obviously love robotics and I love acting, and it was really, really great. The actual team that I mentor was there on the filming day, and a lot of the students I know through FIRST Robotics were there, which was exciting and fun for them. They don’t really know much about the TV world, so it was cool for them to see that side of things. Are there any plans for your character to return in future episodes of The Fosters? I did the one episode and that was the big championship, so I don’t know what’s down the road. Mariana is a girl with a lot of interests. She has dance team and coding, so who knows if we’ll see Sasha again? You currently play one of the main characters on NBC’s Aquarius, which is set in the late 1960s. Robotics competitions didn’t even exist then! What would your Aquarius character Emma Karn think of your Fosters character Sasha, and of the idea of women in robotics? The thing about Emma in Aquarius is she’s sort of a follower. She doesn’t have a very strong backbone – she’s very young and naive and is up for any experience. I think she would be really enamored by robotics. She would think it was the most amazing, exciting thing in the world! But to be honest, I don’t think Emma would think she could do robotics, which makes me really sad. She is from the late ’60s, and I don’t think there were a ton of women doing STEM then. I don’t think she would get along with my character Sasha, but she definitely would love Mariana, for sure. I think they would be good friends. Mariana has a really spunky spirit that Emma would look up to, and Mariana could show her the ropes and teach her the code. Lastly, Aquarius is currently halfway through its second season – what can we expect from the second half? All I can really say is there’s lot of drama! The first half of the season is a little bit glamorous – there are a lot of fun parties, and you get to see the music industry and that world. Then in the second half, things get a little bit darker for everybody. The show is very different from The Fosters! Thanks to Emma Dumont for chatting with us! Follow her on Twitter and Instagram, and don’t forget to watch her on Freeform’s The Fosters Monday night at 8/7c. For more information about FIRST, check out firstinspires.org.